Most people who walk by the parking lot next to the state office building at 133 State Street in Montpelier are unlikely to notice anything special about it. Neat white lines on the blacktop mark off spaces for 107 cars. But to Chris Kilian, Vermont director of the Conservation Law Foundation, the tarmac is cause for excitement. "It's actually really neat to see," Kilian said, as he led a guided tour of Montpelier parking lots, pointing out the good, the bad and the promising. 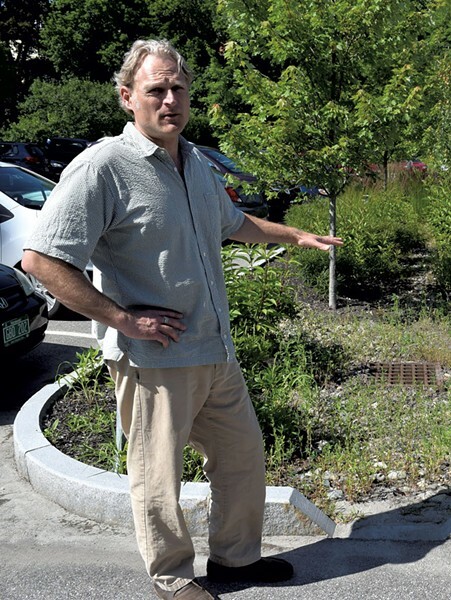 Kilian could chat all day about Vermont storm drains, a topic he's been studying for 25 years. Entering a parking lot, the tall and talkative environmentalist is thinking not about where to park a car, but where the rainwater flows. Often, stormwater washes pollutants that gather on impervious surfaces directly into waterways. But at 133 State Street, the water runs through curb cuts and into two rock gardens. There, it seeps into the ground, gets filtered through gravel and porous soil and irrigates a variety of plants — leafy trees as well as ground-hugging shrubs, which provide lush green between patches of pavement. A new state law will require many more parking lots around Vermont to employ such pollution-prevention techniques. "For the first time, strong programs have been created to deal with runoff from town roads, state highways, and large parking lots and rooftops," Kilian enthused. But what's good for the environment could prove expensive for scores of unsuspecting property owners. These new requirements garnered little attention or debate during the last legislative session. They were part of a larger clean-water bill that Vermont lawmakers passed before adjournment last spring. The new law requires that all impervious surfaces three acres or larger employ pollution-mitigation measures that meet state standards. Those standards were set back in 2002 but did not apply to projects built before then, so plenty of existing parking lots and large rooftops were grandfathered in. Not any more. Now property owners will have to make upgrades at many shopping centers, hospitals, colleges and office buildings built before 2002. Rarely are developers required to make retroactive changes. "It's a big deal for landowners," said Padraic Monks, stormwater program manager at the Vermont Department of Environmental Conservation. "This idea that someone's going to come knocking on your door, so to speak, and say, 'You have to do this.' That's pretty new." Ernie Pomerleau said he doesn't yet know how many of his company's shopping plazas and other properties will need work. It'll be expensive, the president of Pomerleau Real Estate predicted, noting that some parcels could require sophisticated solutions that simultaneously incorporate several practices to manage stormwater. "To go back and retrofit everything in a short period of time, it's going to cause some trauma," he said. "It's a significant obligation going forward," said A.J. LaRosa, a lawyer with the Burlington firm Murphy Sullivan Kronk, who follows stormwater regulations. "I don't think a lot of people understand what they are going to be required to do." LaRosa and Pomerleau both said they'll be watching closely as state officials work out details, such as which standards are required — they are wary the 2002 requirements could be altered — and whether developers will be able to count on the rules staying the same for the foreseeable future. "If you're going to spend a great deal of money, you want assurance it's effective and it's not going to be changed in five years," Pomerleau said. Developers will have input on the rules being written that will set the standards for the permits that regulate such projects, Monks said, before they're inked — by the 2018 deadline. Property owners in the Lake Champlain basin are required to start work on their old lots no later than October 2023; those elsewhere have until October 2028. The state is gathering information about how many properties will be affected, Monks said. He estimated that only about 10 percent of parcels that will be covered by the law are currently subject to stormwater permits. More regulation will slow the flow of oil, grease and heavy metals from cars, nutrients from pet waste, and road salt that rainwater takes from parking lots to rivers and streams. The toxic mix threatens fish and wildlife, kills vegetation and fouls drinking water downriver. In a 2013 report, the state Agency of Natural Resources determined that stormwater runoff from developed land such as parking lots accounts for 14 percent of the phosphorus in the Lake Champlain basin. Agriculture accounts for 40 percent of the poisonous element. Too much of it in the lake creates a hospitable environment for potentially toxic blue-green algae blooms, which have plagued parts of Lake Champlain in recent years and can harm people, animals and plants. Blooms have already forced officials to temporarily close beaches in the Burlington area this summer. Typically, the blooms worsen in late summer. Over the years, Kilian's organization has sued developers whose projects are contributing to the problem. In a 2003 lawsuit, CLF sought to force Hannaford Bros., owner of the Kmart parking lot in South Burlington, to get a federal stormwater discharge permit to control runoff into Potash Brook. CLF lost. Under the new law, the Kmart plaza lot should — by 2023, if not sooner — need a new permit that will require mitigation, Kilian said. "Everybody still says the Kmart plaza is the quintessential example of what needs to change," Kilian said. "Now maybe we'll get it changed, but it's going to take time." CLF also sued the federal Environmental Protection Agency to push for stricter standards on how much phosphorus is allowed to go into the lake. In 2010, the EPA agreed to withdraw approval of Vermont's 2002 water-quality plan after CLF argued it failed to meet federal Clean Water Act standards. Last week, the state and the EPA announced an agreement on a new plan to reduce phosporous entering the lake by 34 percent. This year's state law establishes a Clean Water Fund, which will be financed by a 0.2 percent surcharge on the state's property-transfer tax. It is expected to raise $5.3 million in 2016. The money will pay for state staff to help towns, farmers and loggers implement measures to reduce pollution such as barring cows from streams and standardizing tilling practices, and also to boost enforcement of regulations. The upshot: Eco-friendlier lots such as the one at 133 State Street should become less of a rarity. That lot was part of an EPA program that put a demonstration project in every state capital, said John Ostrum, the state engineer who oversaw the project that was completed in 2010. EPA paid for the design work. The state DEC chipped in a grant to cover the cost of the curb cuts and landscaping. Ostrum said there was an incremental cost — $50,000 — to adding the green stormwater features, but the lot was due for repaving anyway. No parking spots had to be sacrificed in what turned out to be a more functional layout for the lot, according to Ostrum. The gardens, technically called "bioretention systems," do require greater maintenance, he admitted. The plants need to tolerate both wet and dry conditions. "Getting the right mix of plant species turned out to be critical," he said. "The first round of plants needed supplementing after the first few years." The measures could be even more effective if the lot had permeable pavement, which allows stormwater to seep through the surface, Kilian said. But it's still a vast improvement over most nearby parking lots. There are other examples of innovative approaches, on public and private land around the state, which the DEC has highlighted on its website: a rain garden along the Otter Creek in Middlebury, porous asphalt at a hotel and apartment complex in Essex Junction. At the new Waterbury office complex that is under construction, runoff from roofs, parking lots and entry roads will feed into drainage swales rather than the nearby river. A short way down from the 133 State Street lot in Montpelier, Kilian pointed out problems at a state-owned lot behind the Department of Motor Vehicles just feet away from the Winooski River: "Whatever is on the parking lot goes into the river," he said. That includes trash, bird poop, winter salt and sand, and gas and oil residue. "This is another parking lot that just has contouring to a storm drain, and then there's a big pipe that sticks out of the river bank. The total flow distance from the time the water goes into the river is like 40, 50 feet total." Just southwest of the DMV lot, the city of Montpelier owns a lot that Kilian considers a sign of hope. Known as the Carr lot, the property is a former brownfield where the city plans a public-private development that will include a bus station. 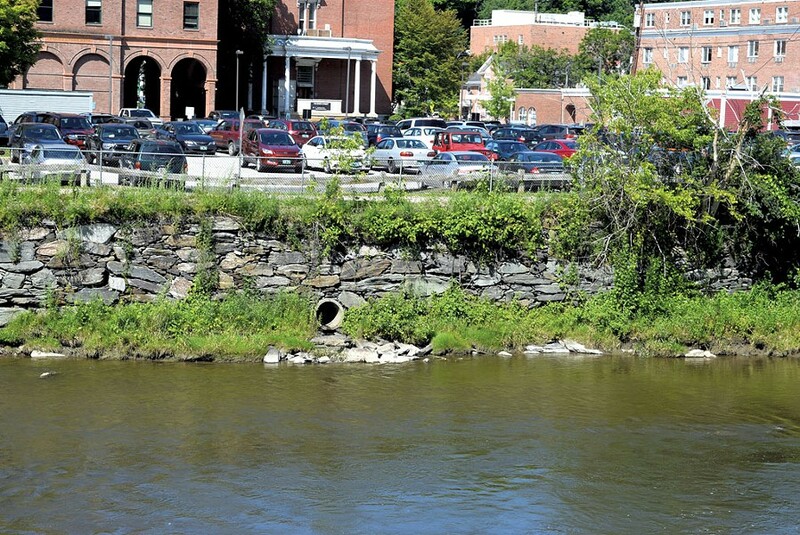 The city is awaiting word on two state grants that will help fund stormwater mitigation measures, said Kevin Casey, community development specialist for Montpelier. It hopes to break ground next year on a project that will include permeable pavement, trees and rain gardens with a temporary stormwater holding pond. Well aware that many state legislators pass by this spot, Casey said he hopes the project will serve as a model of environmentally thoughtful development that can be used elsewhere in Vermont. "We're hoping legislators can say, 'We actually put money toward this project, and this is what we should be doing.'" This story was corrected on 8/25/15 to note the Carr lot is southwest of the DMV lot.